Tali Shiva Temple or Tali Mahakshetram, one of the oldest temples in Kozhikode, Kerala, was built in the 14th century by Swami Thirumulpad, Zamorin ruler of Calicut. It is believed that the Shiva lingam enshrined in the 2-story Sanctum/Srikovil was installed towards the end of Dwaparayuga by sage Sri. Parasurama himself, an avatar of Sri Vishnu. The deity here is called Umamaheswara and the lingam is roughly 2 feet tall. Known for its sanctity, during the Zamorin rule in the 14th century, this temple gained the attention and the then ruler had the temple rebuilt. It is obvious the temple had been in existence for more than 1000 plus years at that point of time. 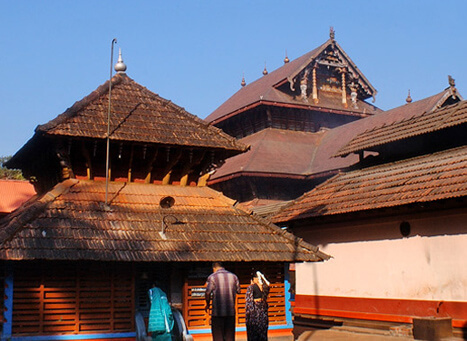 Located in the palace complex of the Zamorin ruler, Tali Shiva Temple at Kozhicode can be easily be marked out as a good example of typical Kerala-style temple architecture embellished with amazing woodwork, wall paintings and wooden roof carvings. Part of the building is made of Laterite stones that blend nicely with the wood work. Interesting features are the intricate brass-relief and murals done with meticulous care on the walls of the sanctum that is designed like a chariot. These paintings have mythological features from Hindu epics. Sage Parasuram also installed the idol of Shasta - Ayyappa here. During the reign of Hyder Ali and later his son Tipu of Mysore, a raid in the Kerala Nadu took place in the 18th century that resulted in the demolition of a few temples and the Tali temple was one of them. Again the responsibility fell on the eighteenth century Zamorin ruler (native rulers of Kozhicode and adjacent areas) of that time to restore the temple back to glory. The present temple was built by Manavikraman. 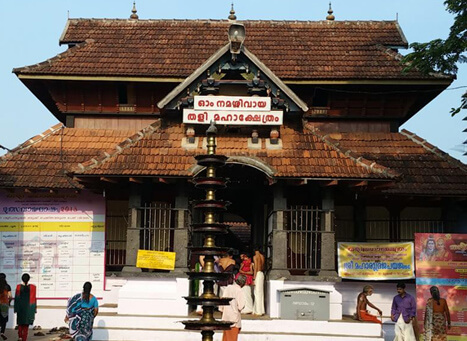 In the wake of a 'Devaprasnam' - a traditional astrological forecast by the Pundits, a typical practice that has been in vogue for centuries in Kerala temples, the restoration was done in 1967. As in many temples in many parts of south India, 5-kala pujas are done and there will be three ''Sivelis'' - procession of idol within the temple premises. The annual festival/Utsavam falls on the day of ''Vishu'' - Kerala's New year day. The one week long festival is a popular one and is well attended by devotees in large numbers. On the 8th day Arattu takes place. This is the ceremonial procession of the deity on the decorated elephant to the near-by bathing ghat. This will be accompanied by well decorated elephants and an array of drummers playing on different drums. There will be cultural programs too like the native dance forms like Mohiniattam, Kathakali, etc. Tali Shiva Temple is a well-known venue for the annual cultural and intellectual event called Revathi Pattathanam, a seminar, which takes place every year in the months of October to November. It is a congregation of scholars and intellectuals under the aegis of the ex-Zamorin rulers. The discussion is mostly on Veda Sastras and their relevance in modern day. The practice began in the 14th century at the initiative of the local ruler. This event is attended by a large number of scholars from across the globe to participate in the animated and thought-provoking debates and discussion on important topics relevant to the society. The temple is managed by a trust controlled by the descendants of Zamorin rulers.